This has been an October filled with gorgeous weather (sun! ), insanity (vote! ), untimely deaths (Tom, more below) and fall colors that brighten our days (larch!). Amidst this comes the latest IPCC Report from the world’s best scientists which, in a nutshell, tells us the pace of climate change is happening way faster and the consequences even more dire, unless we act. The report gives us 12 years to change course on climate pollution. And along with the IPCC report we learned about the coffee and barley and beer. It’s real. It’s happening now. 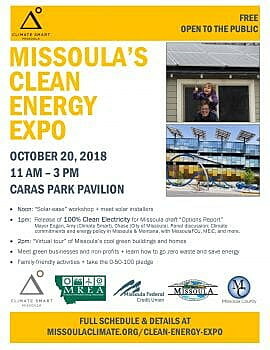 First, come to Climate Smart Missoula’s Clean Energy Expo this Saturday, 11 a.m. to 3 p.m. in Caras Park (see poster, right). Together with our main partners — the Montana Renewable Energy Association, Missoula Federal Credit Union, the city of Missoula and Missoula County — you’ll learn something new, and be inspired with tangible actions. This free event showcases local solar and renewable energy opportunities and businesses, energy efficiency, and other efforts to move our community to clean energy. The Expo also highlights other arenas that intersect with energy, particularly zero waste and active transportation. Partake in family-friendly activities — including Pumpkins for the Pov! Take the 0-50-100 pledge and get involved with any of a dozen organizations. To be clear, it’s more than just an EXPO. This draft 100% Clean Electricity Options Report that we’re releasing is kind of a big deal. Over the years, our city and community have made commitments to act locally on climate change. We have City and Community Climate Action Plans with goals of carbon neutrality. And earlier this year, Mayor Engen endorsed Mayors for 100% Clean Energy, supporting a goal of 100 percent clean, renewable energy in our community and across the United States. So how do we meet such goals? This draft report allows us to get our minds around Missoula’s electricity landscape and options for adding more clean, renewable electricity to our mix. It’s designed to spark a conversation with our community, our utilities, elected officials, and others to determine just how we might achieve 100% by the target year of 2035. It’s a starting place. So where did this Initiative and Options Report come from and why the “All In” headline? About a year ago a whip-smart community member begin working with Climate Smart, the City of Missoula and others to jump start this entire effort. Tom dived right in with incredible energy to understand, document, and get on paper just how we might get more renewable electricity in Missoula. He met with experts. He pushed and prodded. He wrote and foot-noted. This 100% Options Report is now dedicated to Tom Platt—he left us all too soon after a short battle with cancer. We are incredibly sad that he is not here – to author this column, to explain the intricacies of energy regulations, to shine his huge smile on all of us as he talks about just how great solar energy is. “Keep this going, it’s important,” he told me just a couple of months ago. As his remembrance service earlier this week, Tom was repeatedly described as a Man of Action and someone who was always “all in.” He has inspired me to stay all in and to bring others along. We hope you’ll join in. 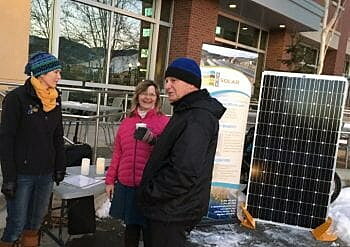 And isn’t it rather curious that the sun has been shining bright here in Missoula every single day from Tom’s memorial service until and through this Clean Energy Expo? There’s hope. Amy Cilimburg is the Executive Director of Climate Smart Missoula. This Sustainable Missoula column is brought to you – via the Missoula Current – every Friday by Climate Smart Missoula and Home ReSource. October 21: 9th Annual Tweed Ride – 1:30-5 pm, Starting at Free Cycles. November 1. Climate Smart Missoula’s Monthly Meetup: Sustainable Economic Development. 5 – 7 pm in the Community Room at Imagine Nation Brewing. November 8. Montana Natural History Center. Learn about climate change and earth’s processes with Dr. Steve Running. 3-4:30 pm. View more climate and energy events via Climate Smart Missoula’s Calendar. There are many more conservation events for the upcoming months HERE.